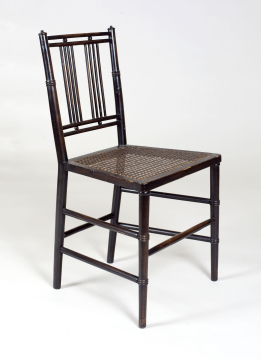 Ebonised caned chair, one of a pair including XF147 & XF148, English, unknown maker, early nineteenth century, beech and cane. ©Sir John Soane's Museum, London. Photograph: Hugh Kelly. One of a pair with XF147. Each has two sets of four vertical splats and a top rail made up of two rails connected with two balls; three rings on the sides of the chair backs and two sets of three rings on the legs either side of the stretcher. Two sets of three rings on legs either side of the stretcher. One of these chairs is pictured in the Study in each of the two views (P86 and Plate VII from the 1835 Description).They are similar in feel to the small chairs painted in imitation of bamboo, which seem to have been in the attics in 1837 (see XF19, XF20, XF84, XF168 and XF180). They are shown in early views of the Breakfast Parlour, but were moved from there to the Study when Soane acquired the set of eight trellis-back chairs (XF19, XF20 and XF84) in 1821 and put some of those into the Breakfast Room. 2 SM Archive XVI.A.4.2, Robins’s account for 1821 includes an item dated item June 28 ‘Repairing & staining your 12 spindle back chairs & caning the seats £3’.